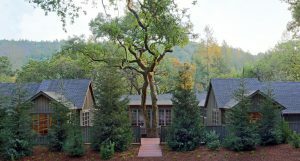 The wait is finally over: the new luxurious all-suite Meadowood Spa at Meadowood Napa Valley is open for guests and members. I’m excited to be joining in the celebrations tonight, which includes a comprehensive tour led by Director of Spa & Wellness Michael Conte, Manager of Health & Fitness Kerry Brackett and Spa Manager Jennifer Brunetti. According to the North Bay Business Journal, the spa is just part of Meadowood Resort’s recently completed $60 million renovation that began last year. Guests and Members will now be able to enjoy the property’s completely re-designed guest rooms and a renovated nine-hole golf course. Having stayed in the penthouse recently and seen many of the redesigned guest rooms, I can assure you the experience is Napa Valley luxury all the way. Led by Director of Spa & Wellness Michael Conte, the 14,000-square-foot spa was designed by famed architect Howard Backen and his team at Backen, Gillam & Kroeger Architects, led by David Macneill and interior designer, Leslie Hemmings. The style of architecture reflects and respects the landscape: simple, rustic-modern structures with a strong connection to beyond the building itself, with natural elements flowing throughout. The spa has eight suites, each with a private bathroom, steam shower and built-in seating in a lounge area in front of large sliding windows that open out to forest views. There are two “relaxation gardens:” one for women and one for men. Each features sitting areas, steam room and sauna, and mineral soaking pool. To go along with the new spa, Meadowood Grill Chef Victoria Acosta has designed an exquisite culinary menu, offering delectable and healthy options to enjoy in suites or the relaxation gardens in the spa. A private, 250-acre estate, Meadowood offers luxury lodging, golf, tennis, croquet, hiking, swimming, spa and fitness, wine and a three-Michelin-star dining experience. Also a private club, the destination counts Napa Valley’s most prominent vintners among its members. It is also a member of Relais & Chateaux. Perhaps the news about the renovation at the new Meadowood will give you reason enough to book a getaway to the world-class resort. If, while you’re here, you’re inspired to move to Napa Valley, please contact me at 707-738-4820 or email [email protected]. As a top producing Realtor® in this area, I have access to some extraordinary wineries, vineyards, estates and homes that are not on the open market.